An agent is someone you hire to assume a certain role, exercise limited authority, and carry out a specific set of tasks that you have set out for them. Far from being mercenaries, you often encounter such agents as sales agents, real estate agents, booking agents, travel agents, tax agents, and the like. 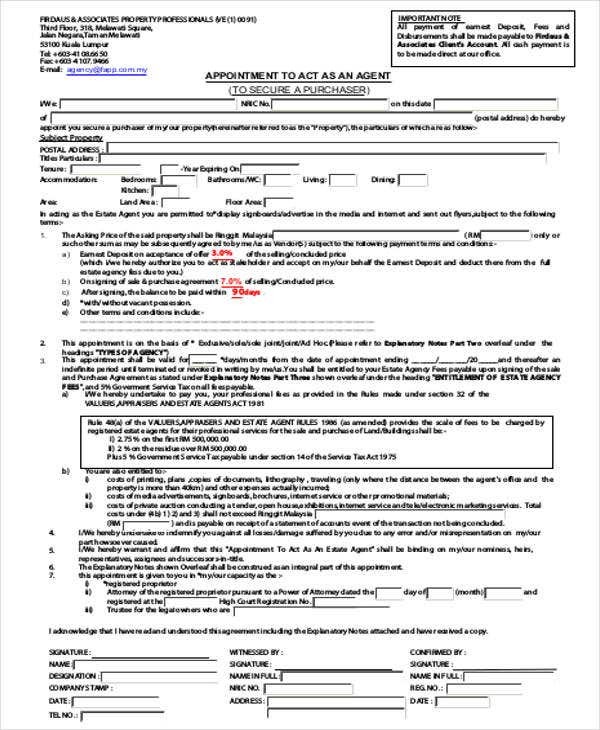 An agency contract will appoint and bind the agent to the principal (employer), thereby giving the agent the power to act with the authority of the principal. Agents may have one or several principals, depending on the industry. 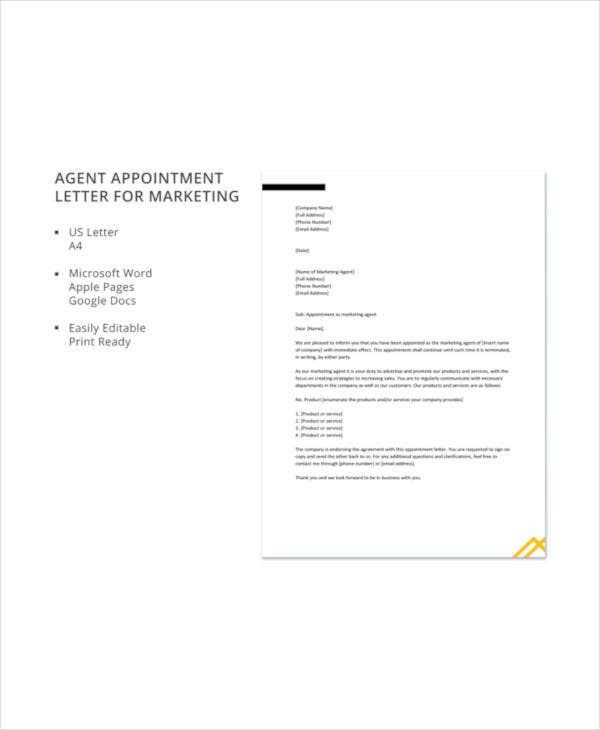 If you are appointing an agent, the first step after the initial offer letters and solicitations is to prepare a Letter Template to formally accept the agent and start the partnership. Here are some free documents you can use as templates for this purpose. By the time you are ready to appoint an agent, you have chosen an agency and done your research, and perhaps have even spoken to the agent beforehand. 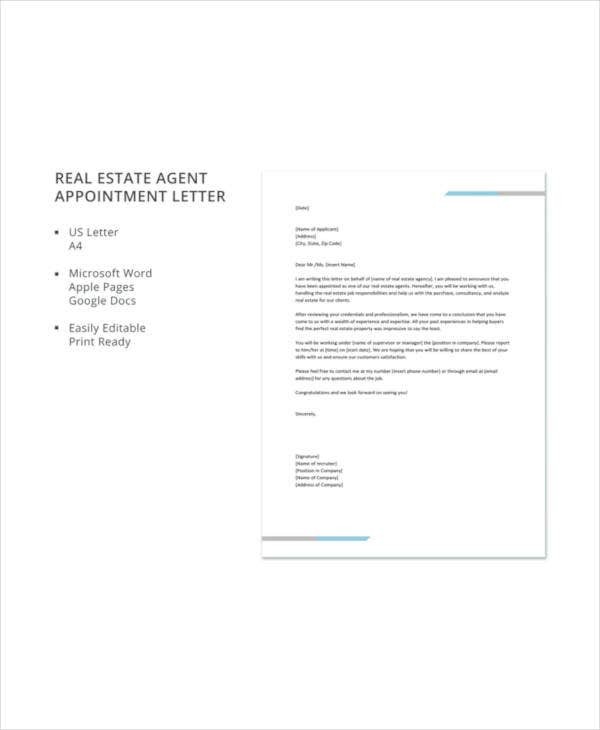 The next step is to send the agent appointment letter to formally accept the agent, especially if the agency has sent an offer letter beforehand for their services. 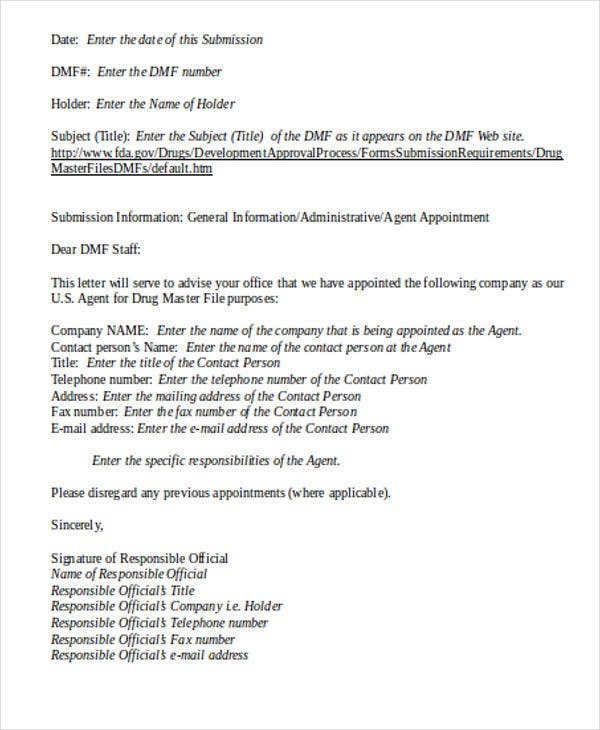 If the agency appointments are managed by a supervisor or agent brokerage firm, you will have to address the appointing letter to this person acting as the middleman. They will then inform the agent, who may be operating his or her business independently from a separate address. Often, you won’t be able to reach an agent other than through their broker. 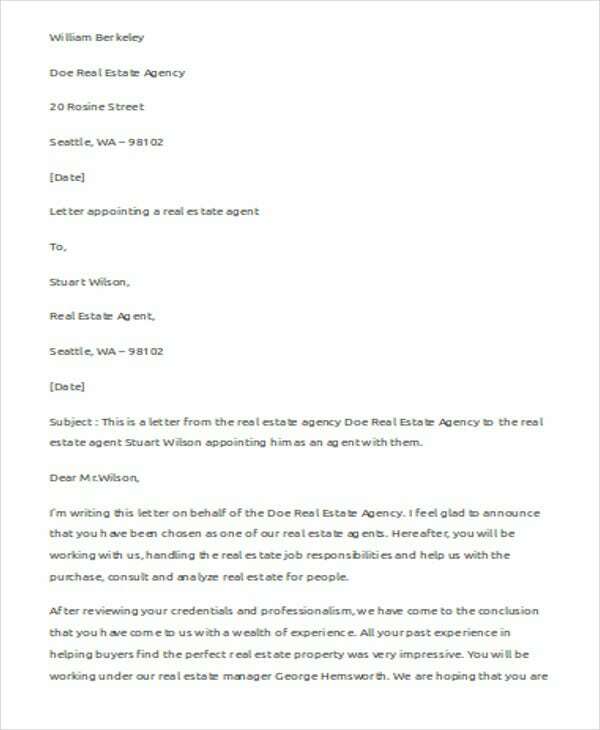 See Insurance Agent Appointment Letter Template. 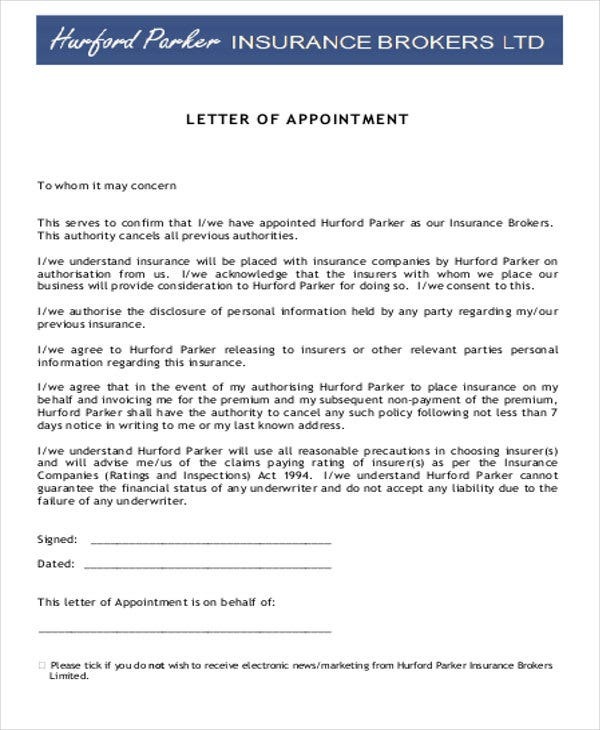 In this example, you will be addressing the broker program manager about your company’s choice of agent as your sole insurance representative. 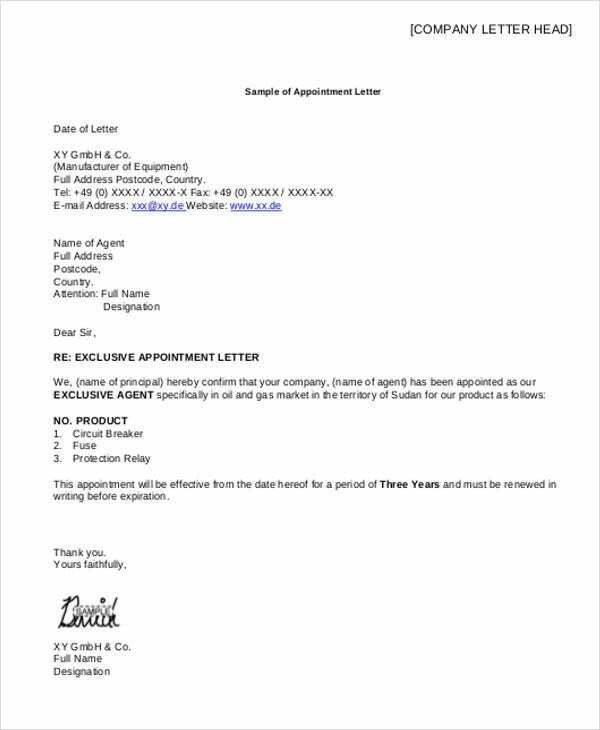 Also see Company Agent Appointment Letter Template for an example of what you will send to the brokerage to confirm your appointment of their services. 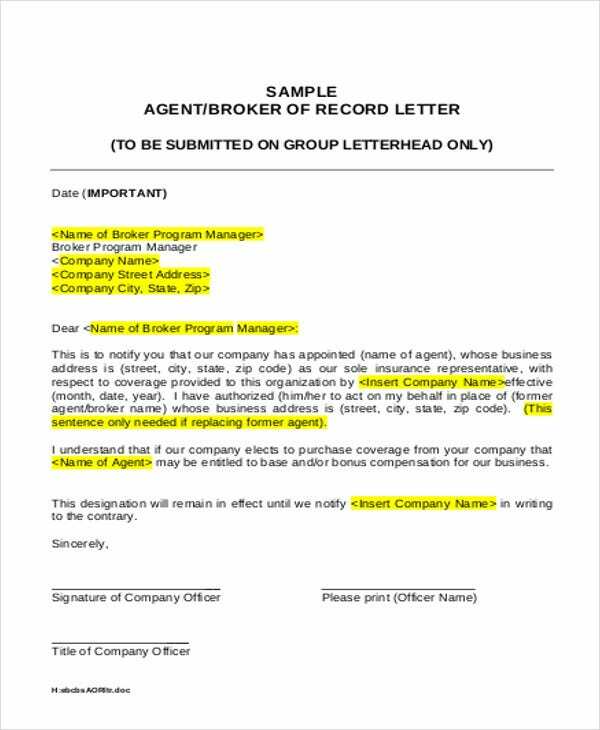 If you are hired as an agent through your brokerage or agency, sometimes it is the program manager who will be formally receiving and responding to the appointment letters. Within smaller firms with fewer agents (perhaps you are an agency of one), you have the responsibility of directly communicating with your employer. If it is within your power to do so, sending a Thank-You Letter to Recruiter would set the professional relationship to a good start. Many of these examples have been tailored to fit several kinds of agencies to give you a broader array of options. 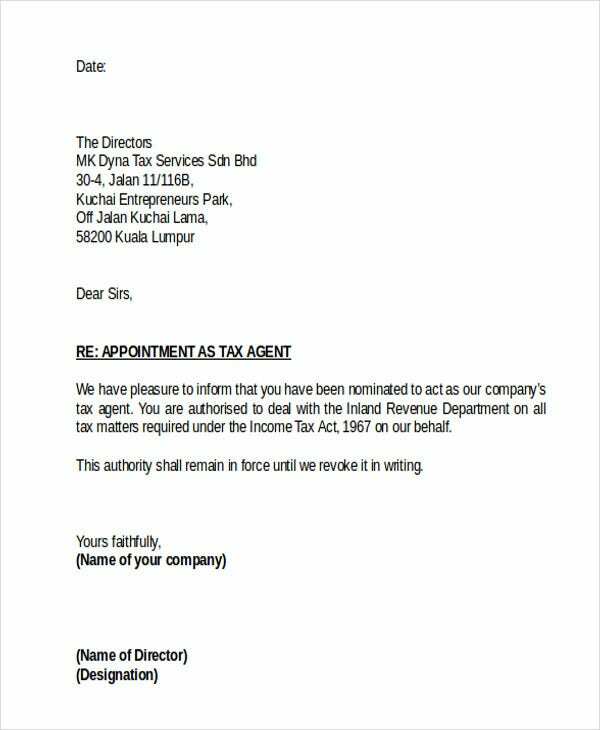 These are intended for the appointing establishment addressed to the broker agency. 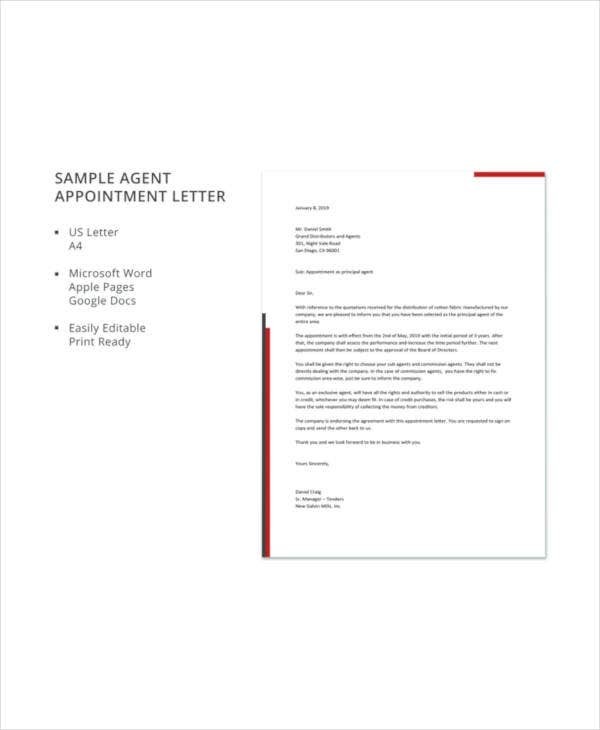 You will be able to base your own appointment letters on these templates depending on your line of business and in line with the agents you are hiring. Look out especially for downloads available in Word document file formats. These can be edited much more easily. How would you go about terminating an agency contract? If there has been a breach of contract terms, or there is some other neutral situation you are no longer in need of their services, a Free Termination Letter Template will help you accomplish this task with as least friction and legal complication as possible.